A federal court in Oregon has signed off on a highly peculiar judgment against a Dallas Buyers Club pirate. Citing "financial hardship," the woman doesn't have to pay the $7,500 in costs and fees as long as she promises not to download any infringing material in the future, and removes any and all BitTorrent clients. The makers of Dallas Buyers Club have sued thousands of BitTorrent users over the past year. Many of these cases end up being settled for an undisclosed amount. This is usually a figure around $3,500, which is what the company offers in their settlement proposals. However, there are exceptions to this rule with damages and costs in some cases hitting $14,000. This week we stumbled upon a new consent judgment between Oregon resident Krystal Krause and the movie studio. In this case the Magistrate Judge signed off on an order that requires the defendant to pay $7,500. “In recognition of the financial hardship and extenuating circumstances in this case, plaintiff agrees that though the below Money Judgment shall be entered and enforceable, plaintiff will not execute or enforce the Money Judgment so long as the defendant complies with the below Permanent Injunction…,” the consent order reads. The court documents do not explain what the extenuating circumstances are, but it suggests that money isn’t the only issue. Looking more closely at the permanent injunction it appears that there are more reasons why the order is unusual. In addition to barring any future infringements, Krause can’t use BitTorrent for legal purposes either. In fact, she has to remove all BitTorrent and P2P software she has installed. 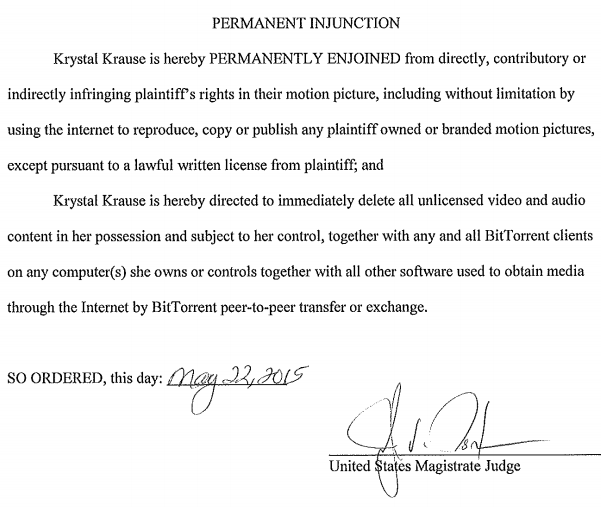 “Krystal Krause is hereby directed to immediately delete […] any and all BitTorrent clients on any computer(s) she owns or controls together with all other software used to obtain media through the Internet by BitTorrent peer-to-peer transfer or exchange,” it reads (pdf). For Krause it may be a small sacrifice to make, especially when it saves $7,500 in costs. That said, it’s still highly unusual to order someone to remove software that by itself isn’t infringing at all. c There are 239 comments. Add yours?